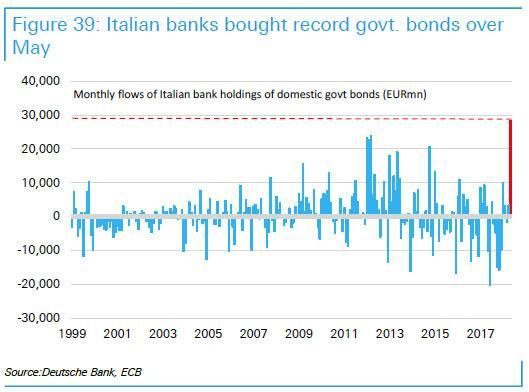 One month ago, we reported that in the aftermath of Italy's political fireworks in May, which saw a record spike in Italian government bond yields, ECB data showed record buying of BTPs by Italian banks in May amounting to €28.4bn (chart below), a higher inflow than anything seen during the European sovereign debt crisis in 2012. 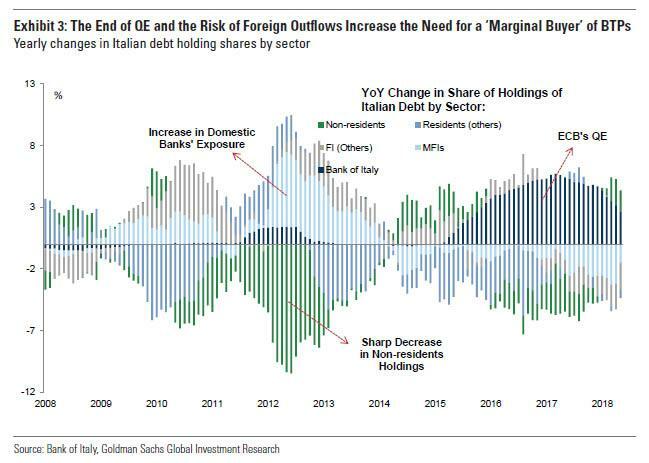 And since local banks buying (to avoid a market crash with the backstop of the ECB), it meant foreign holders of Italian bonds were liquidating a record amount of bonds in the same period, and that Europe's "doom loop" had just made a thunderous return. Or so we thought until we saw the June numbers. 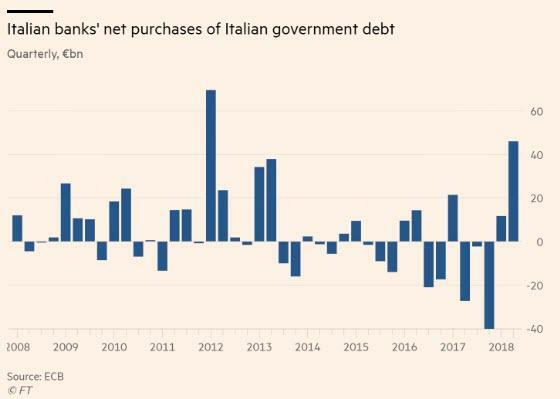 Because just one month later, we find that the exodus of foreign investors from Italy’s bond market accelerated, with net sales of Italian government debt climbing to a record level for the second month in a row. Specifically, holdings of Italian debt by foreign investors declined by a net €38bn in June, according to the latest ECB data, eclipsing the previous month’s net fall of €34bn, which was itself a record as the FT confirms. During this period, Italian bond yields remained elevated, with 10-year debt lingering near the peak it hit in May when the country’s two populist Eurosceptic political parties formed a coalition government. Incidentally, the selloff of Italian 10Y bonds has accelerated in recent weeks, with the 10Y reaching the May highs. 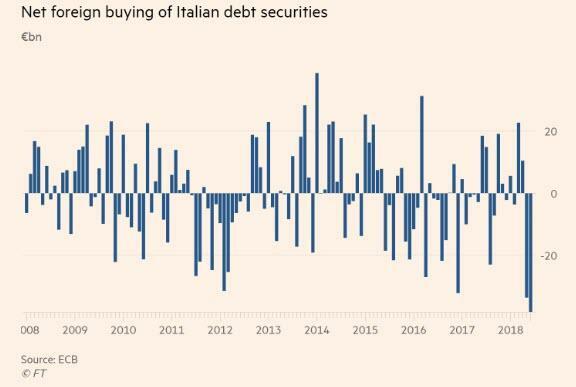 Commenting on the June plunge, David Owen, chief European economist at Jefferies said that "we had suspected that net foreign selling of Italian debt securities had continued into June, but the June figure was still significantly more than we had expected." "Italian banks were, to a large extent, on the other side of the deal: in the second quarter of 2018, domestic financial institutions increased their net holdings of the government’s debt by more than €40bn, the largest amount since the height of the eurozone debt crisis." More narrowly as the following Citi excerpt reveals, Italy saw a record capital outflow of €76bn in the two months of May and June, larger than previous 2-month outflow record of €51bn hit in Jun-Jul 2011 and €56bn in Feb-Mar2012. These flows are shown in the charts below. What happens next and will the paniced liquidation continue? Seaparetly, Allianz chief investment officer for fixed income, Mauro Vittorangeli, said Italian yields had “settled into” a “new range” and added that if the volatility of Italian yields steadies once the budget discussions are completed, then Italian retail investors and the nation’s banks will buy back into the market, which could help prices to bounce back somewhat. Of course, if the budget discussions disappoint and Italian bonds take another step lower, well then there's always Italian banks to buy even more debt, knowing that they have the ECB to backstop them. The problem is that the ECB's QE backstop runs out at the the end of the year. There are two more immediate threats: according to Vittorangeli, two key factors that markets would be watching are the eurozone’s growth outlook — because “Italian debt needs positive nominal growth” to be sustainable — and the continued presence in government of Giovanni Tria as finance minister. If Mr Tria departs, this could be read by investors as a confrontational move by the populist coalition, Mr Vittorangeli warned. The silver lining is that Italy’s woes, and the Italian sovereign bond liquidation have not spread to other eurozone markets, according to Mr Owen of Jefferies. All that would take for that to change, however, is a few more month of record selling of Italian bonds before investors bail on Italy and - with the ECB set to end its QE in just over 4 months - reignite the European sovereign debt crisis.